We have partnered up with Wood Street Mission to help give children access to books and hopefully develop a love of reading. Wood Street Mission provided a dedicated bookshelf full of books for children aged 0-5. It is proudly located in Northmoor Community Laundrette which is open every day. 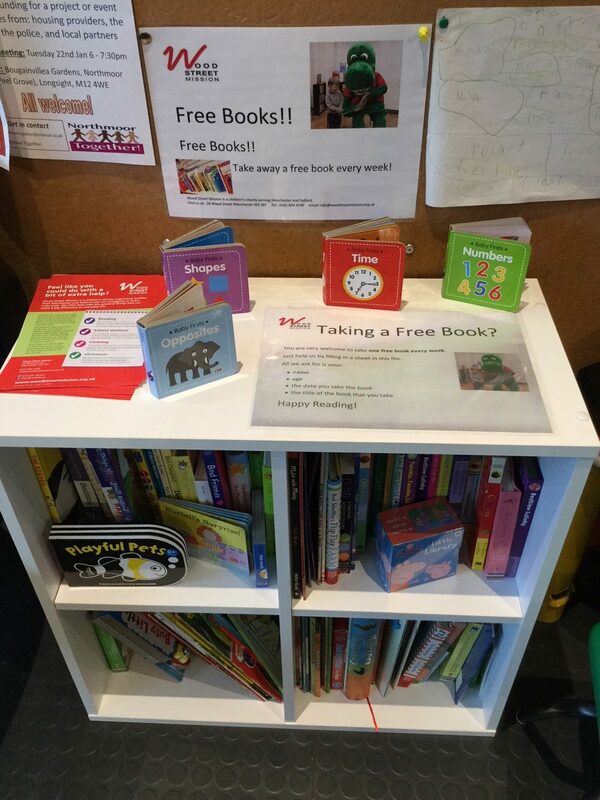 Children can take one book a week which they can keep. Wood Street Mission is a children’s charity helping children and families living on a low income in Manchester and Salford. They offer practical support, education and raise awareness of child poverty. Click here to read more about the services they offer. There are also books for children 5-10 and 11+ on the shelves next to the bookcase. Come down, grab a chair and have a read! Our opening times are: 12-8pm Monday, 10am-8pm Tuesday, Wednesday, Thursday, Friday and Sunday, 9am-8pm Saturday.